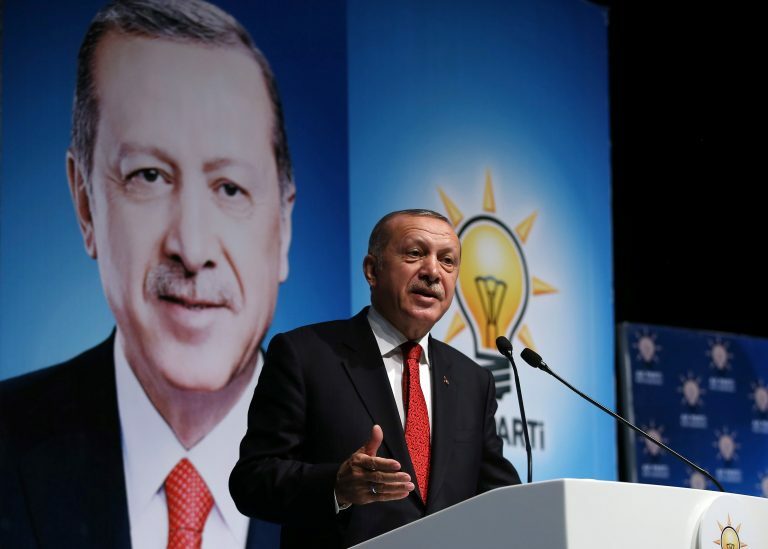 Speaking to supporters in Trabzon on the Black Sea coast, Erdogan dismissed suggestions that Turkey was in a financial crisis like those seen in Asia two decades ago, dampening expectations of a rate rise to support the currency. The Turkish lira has lost about 40 percent of its value this year, largely over worries about Erdogan's influence over the economy, his repeated calls for lower interest rates in the face of high inflation, and worsening ties with the United States. On Sunday, he said the lira's free-fall was the result of a plot and did not reflect Turkey's economic fundamentals. "Interest rates are an exploitation tool that makes the rich richer and the poor poorer," Erdogan said. "Nobody should try to make us fall into this trap, we won't be fooled by this plot, nobody should get excited." His comments on interest rates -- and his recent appointment of his son-in-law as finance minister -- have heightened perceptions that the central bank is not independent. On Sunday, he said the lira's free-fall was the result of a plot and did not reflect Turkey's economic fundamentals. "What is the reason for all this storm in a tea cup? There is no economic reason for this ... This is called carrying out an operation against Turkey," he said. Erdogan's remarks also knocked back investors' expectations of a rate hike from the central bank. On Friday, the lira sank to a fresh record low, falling as much as 17 percent at one point, prompting calls from investors for central bank action to shore up the lira. "I am specifically addressing our manufacturers: Do not rush to the banks to buy dollars. Do not take a stance saying 'We are bankrupt, we are done, we should guarantee ourselves'. If you do that, that would be wrong. You should know that to keep this nation standing is ... also the manufacturers' duty." Turkey's spat with the United States has further weighed on the lira. The two NATO allies have been at odds over a wide range of issues: diverging interests in Syria, Ankara's ambition to buy Russian defence systems, and more recently the case of Andrew Brunson, an evangelical pastor on trial in Turkey. After Brunson had been in jail for almost 20 months, a court in July ordered him to be moved to house arrest. Since then Trump and Vice President Mike Pence have called for his release, while Ankara says the decision is up to the courts. Washington in response sanctioned two Turkish ministers, and Trump on Friday announced the United States was doubling tariffs on steel and aluminium imports from Turkey, saying relations with Ankara were "not good at this time". "Our response to those who wage a trade war against the whole world and include our country in that would be heading towards new markets and new alliances," Erdogan said. Last week, a Turkish delegation went to Washington and met American counterparts but there was no breakthrough. On Sunday, Erdogan revealed details of talks between the two countries over the pastor, saying, the United States had given Turkey until last Wednesday it to hand over the pastor. "If we did not release him, they said they would sanction us... What happened? Immediately, we have imposed the same sanctions on their ministers," Erdogan said.